As Senate Republicans face mounting criticism for including almost exclusively white men in their working group on the upcoming health care bill, media aren’t doing much better when discussing the legislation. Like the GOP, media are relying on mainly white people, particularly men, for their analysis and reporting on the health care bill, even though the bill would reportedly have serious consequences for women and minorities. 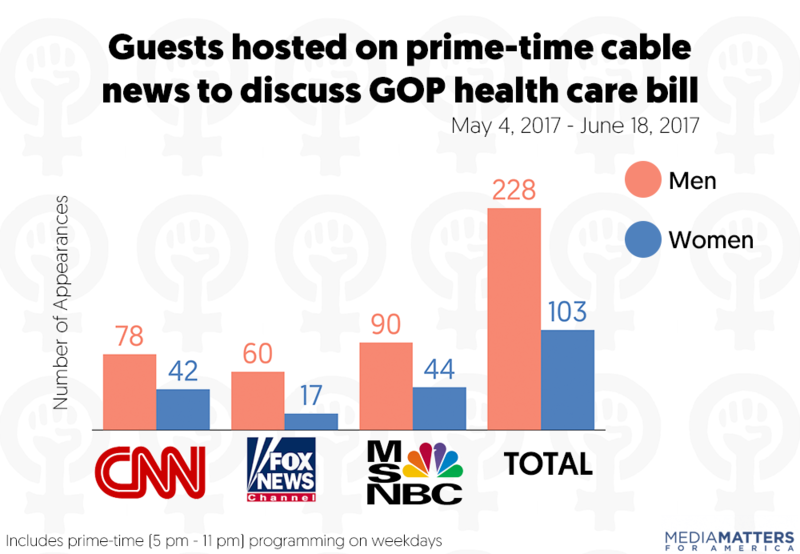 Male guest appearances outnumbered female guest appearances 2-to-1 on prime-time cable news, broadcast morning and nightly news shows, and Sunday morning political shows during discussions of the Republican health care bill. 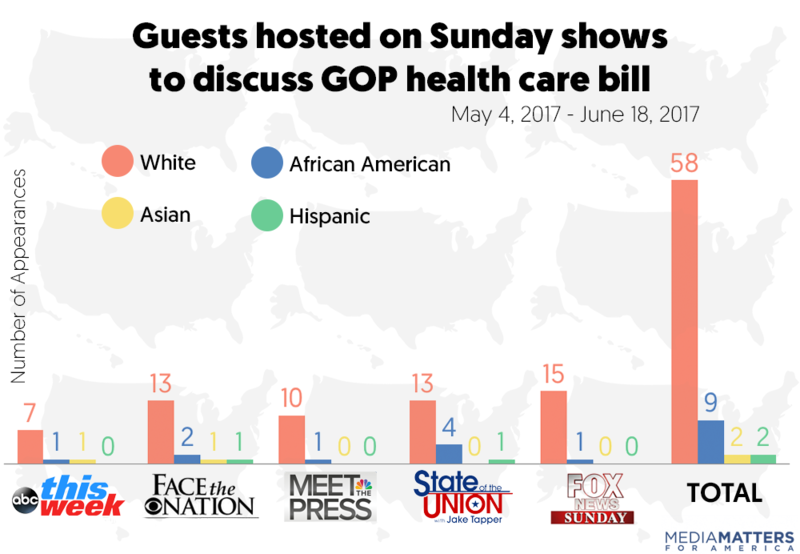 Over 87 percent of appearances on prime-time cable news, broadcast morning and nightly news shows, and Sunday morning political shows during discussions of the Republican health care bill were made by white guests. Of the 448 guest appearances* on prime-time cable news, broadcast morning and nightly news shows, and Sunday morning political shows, 392 appearances, or over 87 percent, were made by white guests. Fox News hosted 77 guests during discussions of the bill. Of those guest appearances, 75, or over 97 percent, were made by white guests. Only two appearances were made by black guests, and there were no appearances made by Asian or Hispanic guests. CNN hosted 120 guests during discussions of the bill. Of those guest appearances, 108, or 90 percent, were made by white guests. Only seven appearances, or 6 percent, were made by black guests, three appearances by Asian guests, and two appearances by Hispanic guests. MSNBC hosted 134 guest during discussions of the bill. Of those guest appearances, 108, or over 80 percent, were made by white guests. Eighteen appearances, or about 13 percent, were made by black guests, four, or nearly 3 percent, by Asian guests, and four appearances by Hispanic guests. ABC hosted 12 guests during discussions of the bill. Of those guest appearances, 10, or just over 83 percent, were made by white guests. The network hosted no black or Asian guests, but two appearances, or 7 percent, were made by Hispanic guests. CBS hosted 16 guests during discussions of the bill, all of whom were white. NBC hosted 18 guests during discussions of the bill. Of those guest appearances, 17, or over 94 percent, were made by white guests. The network hosted no black or Asian guests, and only one appearance, or about 5 percent, was made by a Hispanic guest. ABC's This Week hosted nine guests during discussions of the bill. Of those guest appearances, seven, or nearly 78 percent, were made by white guests. Only one appearance each was made by black and Asian guests, but the program did not host any Hispanic guests. CBS' Face the Nation hosted 17 guests during discussions of the bill. Of those guest appearances, 13, or over 76 percent, were made by white guests. Two appearances were made by black guests, one by Asian, and one by a Hispanic guest. NBC's Meet the Press hosted 11 guests during discussions of the bill. Of those guest appearances, 10, or nearly 91 percent, were made by white guests.One appearance was made by a black guest, but the program did not host any Asian or Hispanic guests. CNN's State of the Union hosted 18 guests during discussions of the bill. Of those guest appearances, 13, or over 72 percent, were made by white guests. Four appearances were made by black guests and one by a Hispanic guest, but the program did not host any Asian guests. Fox Broadcasting Co.'s Fox News Sunday hosted 16 guests during discussions of the bill. Of those guest appearances, 15, or nearly 94 percent, were made by white guests. One appearance was made by a black guest, but the program did not host any Hispanic or Asian guests. Of the 448 guest appearances* on prime-time cable news, broadcast news’ morning and nightly shows, and Sunday morning political shows, 299 were made by men, meaning two-thirds of the voices viewers heard were male. 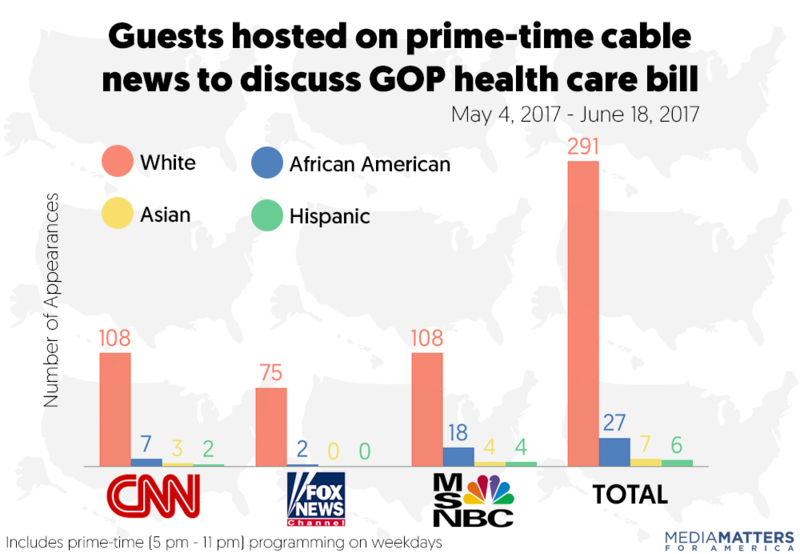 Fox News hosted 77 guests during discussions of the health care bill throughout prime-time programming. Of those guest appearances, 60, or nearly 78 percent, were made be men. 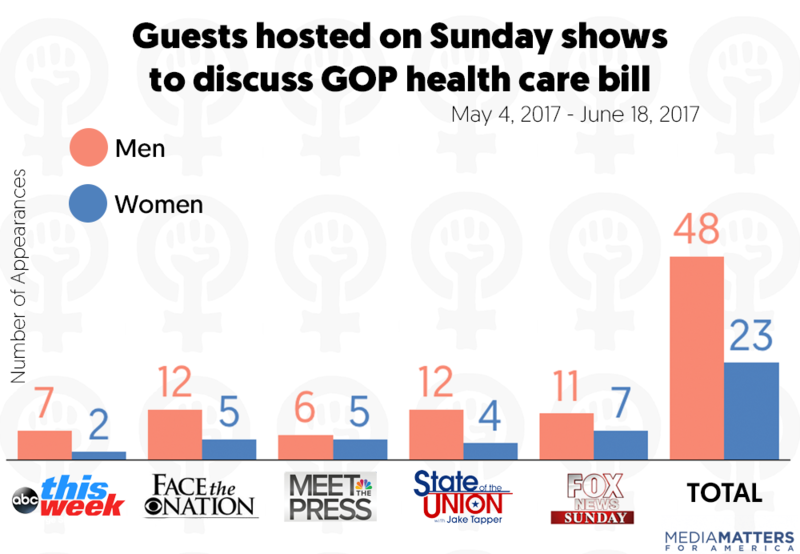 Only 17 of the appearances were made by women, making up about 22 percent of guest appearances on the health care bill. 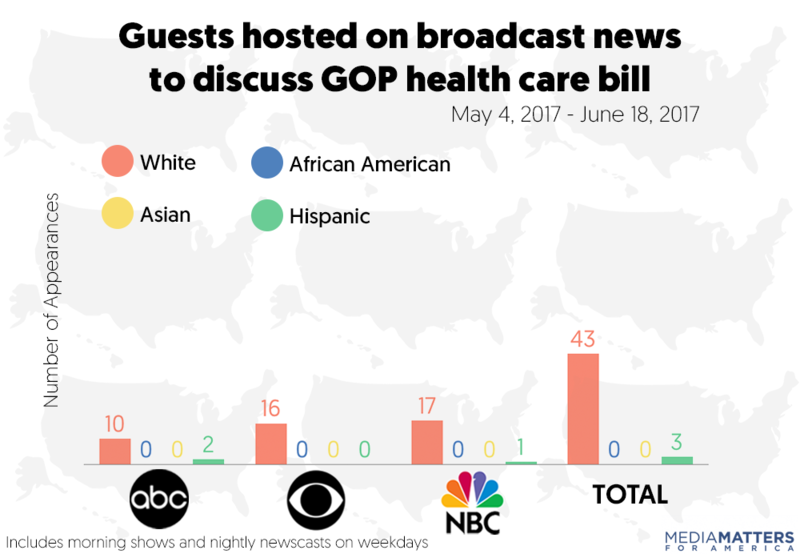 MSNBC hosted 134 guests during discussions of the health care bill throughout prime-time programming. Of those guest appearances, 90, or over 67 percent, were made by men. Only 44 of the appearances were made by women, making up just under 33 percent of guests hosted to discuss the bill. CNN hosted 120 guests during discussions of the health care bill throughout prime-time programming. Of those guest appearances, 78, or 65 percent, were made by men. Only 42 of the appearances were made by women, making up about 35 percent of guests hosted to discuss the bill. CBS hosted 16 guests during discussions of the health care bill. Of those guest appearances, 11, or nearly 69 percent, were made by men. Five, or just over 31 percent, were made by women. NBC hosted 18 guests during discussions of the health care bill. Of those guest appearances, 10, or nearly 56 percent, were made by men. 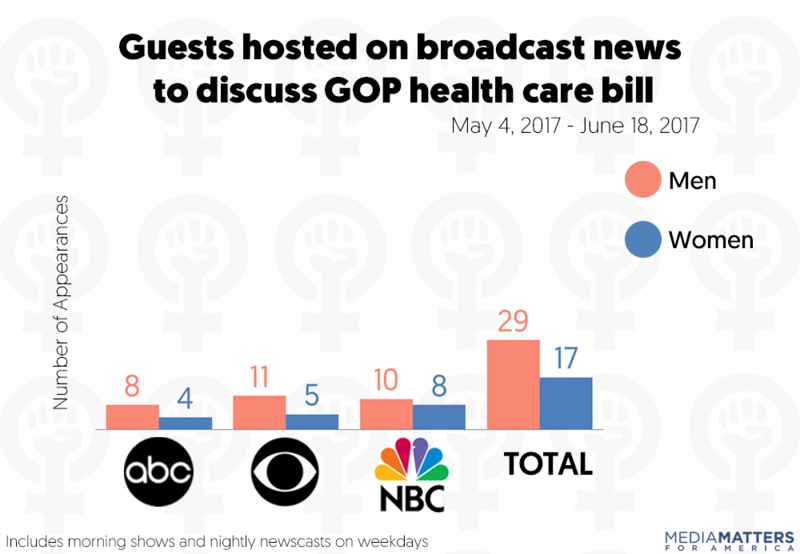 The network featured eight appearances by women in discussions of the bill, making up just over 44 percent of guest appearances. ABC hosted 12 guests during discussions of the health care bill. Of those guest appearances, eight, or nearly 67 percent, were made by men. Four appearances, or about 33 percent, were made by women. ABC’s This Week hosted nine guests during discussions of the bill. Of those guest appearances, seven, or nearly 78 percent, were made by men. Only two appearances were made by women, making up over 22 percent of guest appearances. CBS’ Face the Nation hosted 17 guests during discussions of the bill. Of those guest appearances, 12, or nearly 71 percent, were made by men. Only five appearances were made by women, making up over 29 percent of guest appearances. NBC’s Meet the Press hosted 11 guests during discussions of the bill. Of those guest appearances, six, or nearly 55 percent were made by men. Five appearances were made by women, making up over 45 percent of guest appearances. CNN’s State of the Union hosted 16 guests during discussions of the bill. Of those guest appearances, 12, or 75 percent, were made by men. Four appearances were made by women, making up 25 percent of guest appearances. Fox Broadcasting Co.’s Fox News Sunday hosted 18 guests to discuss the bill. Of those appearances, 11, or over 61 percent, were made by men. Seven appearances were made by, making up nearly 39 percent of guest appearances. Sadly, the groups that have been marginalized by Senate Republicans and television news have a lot to lose with the AHCA. As FamiliesUSA noted, the Affordable Care Act (ACA) “greatly benefited Black communities, who are likely to disproportionately suffer the consequences of ACA repeal and the elimination of Medicaid as we know it” under the AHCA. And, as The Hill pointed out, “Hispanics benefited more than any other group from the Affordable Care Act,” and under the AHCA, “Many Hispanic leaders are worried their communities could be forced out of coverage and back into emergency rooms for primary care.” Additionally, groups fighting for the rights of Asian Americans have condemned the AHCA for the harm it would cause. For women who let their insurance lapse, maternity coverage will no longer be guaranteed, and pregnant women may face surcharges up to $17,000 for care. C-sections could also be considered a pre-existing condition, meaning that a woman could incur costs of roughly $50,000 for simply wanting another child. States could determine that having a heavy period or other menstrual irregularities is a pre-existing condition to be paid for out of pocket. The Republican health care bill presents a clear and present danger to millions of Americans, but minorities and women have the most to lose. Unfortunately, they’re nearly shut out of discussions about the bill, in politics and media alike. * Repeated guests were counted each time they appeared. Media Matters searched Nexis for mentions of health care, the Affordable Care Act, Obamacare, the American Health Care Act, or AHCA on prime-time cable news, broadcast news’ morning and evening news shows, and Sunday political shows between May 4 (after the House of Representatives passed the bill) and June 18. Segments were coded if they included a significant discussion of the Republican health care bill. “Significant discussion” was defined as at least two speakers in the segment engaging on the topic with one another. Prime-time cable news refers to CNN, Fox News, and MSNBC programming between 5 p.m. and 11 p.m. on weekdays. Broadcast news refers to ABC’s Good Morning America and World News Tonight, CBS’ CBS This Morning and CBS Evening News, and NBC’s Today and NBC Nightly News. Sunday political shows refers to ABC’s This Week, CBS’ Face the Nation, NBC’s Meet the Press, CNN’s State of the Union, and Fox Broadcasting Co.’s Fox News Sunday. A chart was updated to include corrected data.